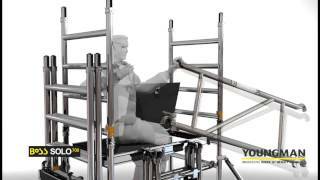 The BoSS SOLO700 access tower is simple to assemble and operate by one person. The access tower can be dismantled to a compact size for convenient store in its own rolling trolley made from the base unit and one platform for easy transportation. The 61402200 rapid build single person access tower has a compact base unit 0.7m wide and 2.2m in platform height. The patented camlock guardrail frames means this tower uses less components than a traditional Boss tower. Part of the BoSS 700 range - Interchangeable components for easy tower conversation.